Everyone loves the Simpsons and their animated antics and now you can get your kids to learn the value of saving money for a rainy day with Wesco's Simpsons animated talking money bank. This money box is a scream and at £37 I'd say "Sod the kids!" and get this for yourself. Firstly it has a number of slots for 1, 2, 5, 10, 20 and 50p pieces and two more slots for £1 and £2 coins. Each slot has it's own animated and audio activity which range from the boring movement of Grandpa's eyes to Lisa playing her saxophone. The level of activity goes up as the value of the coinage increases from the dull 1p animation to the impressive £2 treat - rewarding those big savers. As the money goes in an LCD display keeps track of the total saved and should you want to take some money out to buy a treat then simply press a button and the money is deducted from the total stored - simple. Although I did notice that on more than one occasion the electronics seemed to forget to add the money inserted to the total, but I didn't care as I could simply get the animation to play all over again. I think my favourite had to be Maggie's animation. Put the money in and the littlest member of the Simpson household makes her familiar sucking noise as her pacifier pops in and our of her mouth - how sweet. 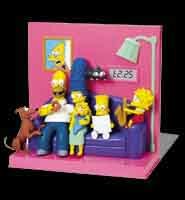 Wesco's Simpson's animated talking money bank will keep you entertained for ages. I am still laughing at the thought of Maggie's pacifier even as I write this. Pure genius.